The Future is Here. The Future is Omnichannel. We are living in a 24/7, always-on economy, where consumers have more choice, freedom and flexibility than ever before and brands are working hard to keep up with the rapid evolution of technology. So how do you compete in this brave new world? Provide a seamless, omnichannel experience. Read on to learn how to optimize your mobile marketing efforts to drive better results across every channel to the customer. Before you can even think about running omnichannel campaigns, you need to take a step back and look at your marketing stack. Is it integrated? Providing a seamless cross-channel experience isn’t possible unless brands can integrate data and insights across every consumer touchpoint: in-store, web, social, mobile app and email. Brands that operate with a siloed mentality are likely to provide consumers with a disconnected digital experience. Brands that can easily exchange data between systems will delight consumers by providing a consistent user experience across every touchpoint. The brands that are connecting the dots between every business function are winning sales and dominating the market. Think of your personal inbox. How much of it is cluttered up with promotional emails? Email is a noisy channel and unfortunately, it’s just getting worse. Too many companies spam their customers with too frequent and/or irrelevant emails. A key step at winning at omnichannel is providing personalized experiences on every channel, and this includes email. Batch and blast doesn’t cut it anymore, consumers see right through it. 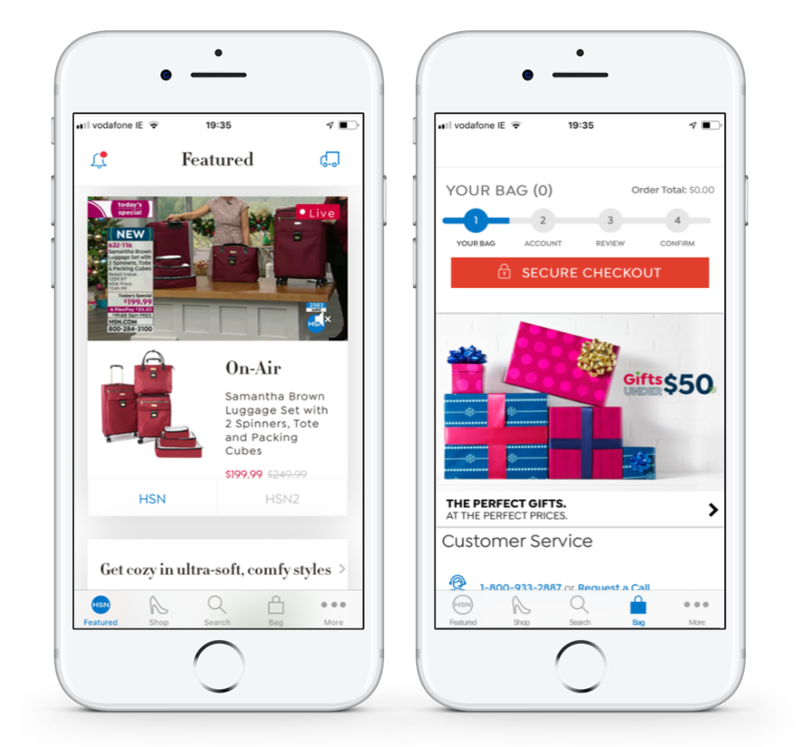 Mobile provides a much more personalized channel to the customer, and some brands have figured out how to better leverage their email audience to drive more engagement with their mobile app. HSN uses email to fuel mobile app downloads to help drive engagement and conversion. Customers that have yet to download the HSN app receive targeted emails which are linked to ‘app-only’ experiences, exclusive features and promotions only available via the mobile app. The customer journey often begins on the retailer’s website as consumer explores the retailer’s offering. This initial site visit is not likely to result in a conversion, as 92% of consumers visit a brand's website for the first time to do something other than make a purchase. This yields a great reason for retailers to feature their mobile apps on their brand’s website. HSN does an excellent job of promoting the mobile app experience on its website, listing six compelling features including live streaming and exclusive coupons. Social media is a must for app promotion. Retailers can connect with their target audience using paid or organic social media campaigns, or a mixture of both! Organic promotion on social media comes in the simple form of having a presence; e.g. an Instagram profile. Retailers should build a community style profile to connect with their audience in a meaningful way. Adidas is a great example of a brand that has built a community on Instagram by posting a mixture of promotional, aspirational and educational content featuring online influencers, professional athletes, and musicians. Paid app promotion will boost your discoverability and get more people downloading and using your app. Adidas uses Instagram ads to retarget site visitors, boost app downloads and fuel in-app conversions based on specific segmentation criteria. Research conducted by Localytics revealed that 36% of people who shop using apps said a mobile location-based push notification influenced an in-store purchase they made. This represents an incredible opportunity for brands to connect their digital and physical marketing strategies. Geofences and beacons are the most effective ways to trigger location-based messaging. Geofences: Radial area around a location. When a user enters or exits a geofence, a brand can trigger a marketing message. A brand can leverage a mobile device manufacturer’s “location services” to know when a user enters or exits a geofence. Beacons: Beacons don’t rely on longitudinal and latitudinal coordinates. Instead they leverage hardware that emits a signal. When a user’s phone detects this signal, a location-based message can trigger. Despite the mass store closures of 2017, the physical store is far from dead. American consumers are split 50/50 on whether they prefer online shopping versus in-store shopping, with in-store being the dominant channel for mature consumers. 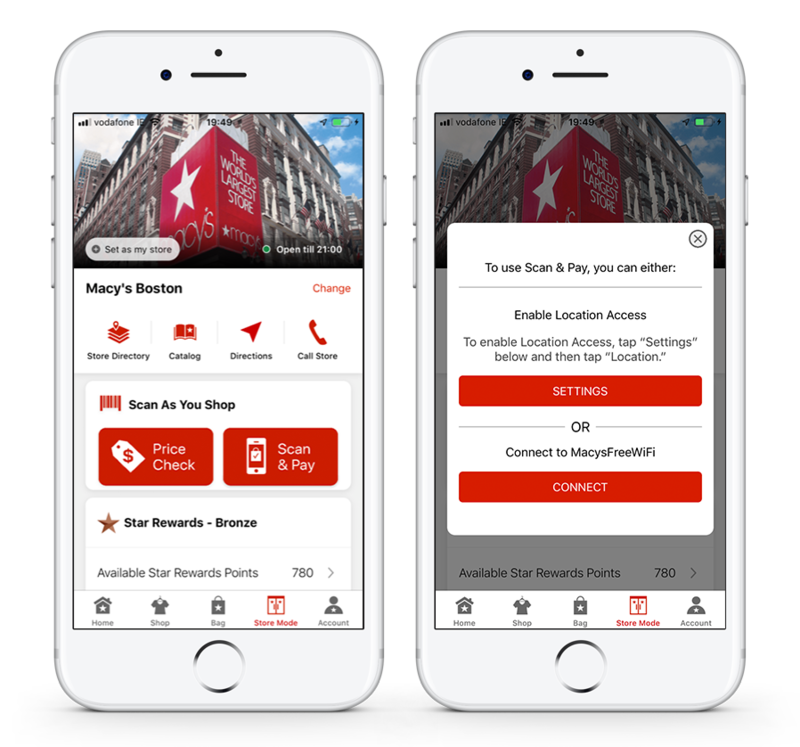 Macy’s is breathing new life into its traditional department stores by combining the human touch of experienced sales associates with cutting-edge technology like mobile checkout to make the in-store shopping experience more efficient. CEO, Jeffrey Gennette, announced that the brand is on track to hit $1 billion in mobile sales by the end of 2018 an incredible achievement. It’s clear that Macy's investment in mobile is paying off. The brand’s mobile app has evolved into a virtual shopping assistant with an array of innovative features including price check, an in-app rewards wallet, promotion catalogue, stylist services and a buy online, pick-up in store feature complimented by a list of local store hours. Providing a consistent brand experience is the key to building consumer trust and loyalty. A number of innovative brands are winning customer loyalty by delivering personalized mobile experiences (supported by a broader omnichannel strategy) that provide users with relevant and valuable information. Personalized cash flow: View a personalized cash flow analysis along with income and spending insights across their banking and brokerage accounts. Shopping cart experience: Clients can now easily and conveniently shop for all of the services Bank of America has to offer from the mobile banking app. My Rewards Dashboard: Clients can manage their Bank of America rewards across the bank’s rewards programs, including Preferred Rewards, credit cards and BankAmeriDeals. 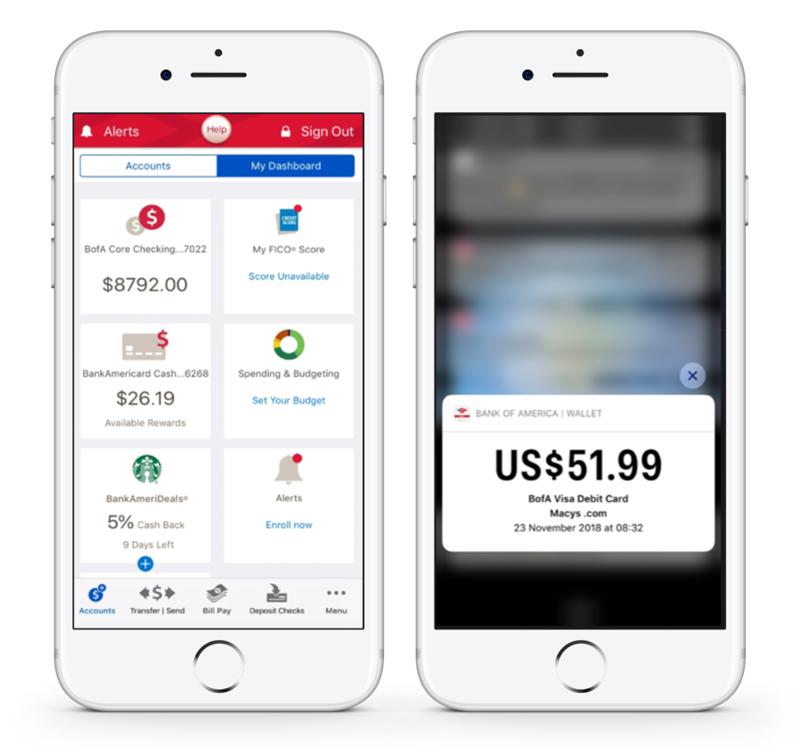 The Bank of America app delivers a consistent brand experience across digital and physical channels by syncing data between mobile, email, CRM and POS systems. For example, when a consumer completes a purchase using apple pay in a physical store or third party app, they receive a push message to confirm the transaction details e.g. time, date and dollar value. The TD Ameritrade mobile app is designed to let traders stay on top of their account wherever they are. The app provides access to equity and options trading, streaming quotes, real-time balances and positions, fund transfers, and extensive news and research. The brand reported growth in mobile trading activity, mid way through 2018, with an average of 210,000 mobile trades per day and a staggering 840,080 unique weekly logins. TD Ameritrade delivers highly personalized messages to users based on their alert preferences allowing users to stay up to date on the information deemed most important to them by setting up price and volume alerts. One cannot emphasize the importance of data protection, especially when managing personal finances. Research shows that two-thirds of consumers that use mobile apps are “very” or “extremely” concerned about data privacy and data sharing. TD Ameritrade is taking a proactive approach to safeguarding personal and financial information. The brand urges users to use biometric verification capabilities such as Face/Touch ID to protect highly-confidential information. Adoption of biometric verification technology is a top priority initiative at TD Ameritrade. The brand launched an in-app messaging campaign to drive feature adoption by providing helpful instructions and educating users on the benefits of using biometric technology. Of the 33,000 users who received the FaceID messaging campaign, 29% enabled the feature. Additionally, of the 189,000 users who received the Touch ID campaign, 13% enabled the feature. Capital One uses experiential marketing to stand out in a noisy financial services market. Consumers are encouraged to visit Capital One Cafés in various cities across the US which are designed to connect the digital and physical banking experience. While many banks have scaled down their physical presence to reduce operational expenses, Capital One identified an opportunity to stand out. The banking brand that began its journey as ‘online-only’, has fostered a strong partnership with Peet’s Coffee to re-imagine the banking experience. Capital One Cafe is a casual environment where consumers can enjoy a coffee and light snack in an outlet that also offers financial advice from experienced professionals and technological tools like mortgage and loan repayment calculators. Capital One has integrated mobile, email and POS systems to deliver a consistent cross-channel experience. The example below shows a push notification received by a Capital One app user after scheduling a credit card payment, this was quickly followed by an email notification which confirmed that the payment had been scheduled. Omnichannel marketing provides a continuous user experience across all channels customers use to access your brand: from your apps and website, to ads and real-world touch-points like your in-store experience. The idea is that we know users frequently hop between channels while interacting with a brand, and we can better serve them by letting them pick up where they left off. From a data standpoint, that means items in their carts are saved. From a content standpoint, messaging is consistent, complementary, and uninterrupted across channels. 90% of the world’s data has been generated over the last 24 months. Enterprise brands have collected more data then they know what to do with. Data is extremely valuable, but, without effective system integrations integral business insights are slipping through the cracks. Teams are using digital analytics and optimization technologies in isolation, creating siloed businesses and serving fragmented brand experiences. The average enterprise brand is using a combination of large marketing cloud software technologies like Salesforce, Oracle or Adobe and/or best-in-breed niche solutions. Those that implement a hybrid of broad and specialist solutions will emerge as revolutionary brands that are truly customer-centric, delivering highly personalized experiences at every touchpoint and adding indisputable value to customer lives. Leveraging mobile to build your omnichannel strategy can be a daunting experience. And to be sure, omnichannel has been knocking around as a buzzword for years, without meeting marketing expectations. But as more and more users expect--demand, really--that brands create marketing that meets them in the spaces they’re using now. Individualize and streamline your experience as much as you can, and you’ll see results. If you’re eager to learn more, visit localytics.com or email marketing@localytics.com to speak directly with the team that powers digital experiences for many of the world’s leading brands including Bose, Redbox, The Weather Channel, Comcast and Wendy’s.